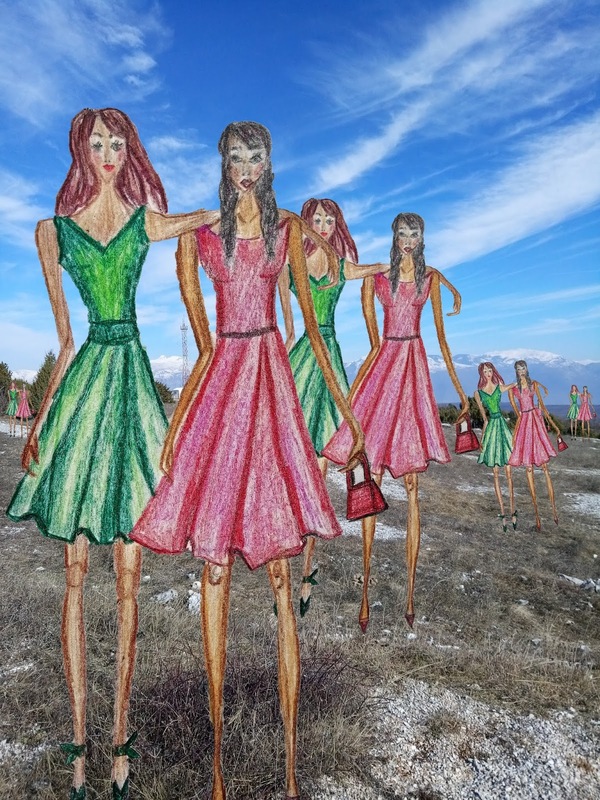 Springs vibes are in the air, and this is especially the case when we're talking about my fashion illustrations. 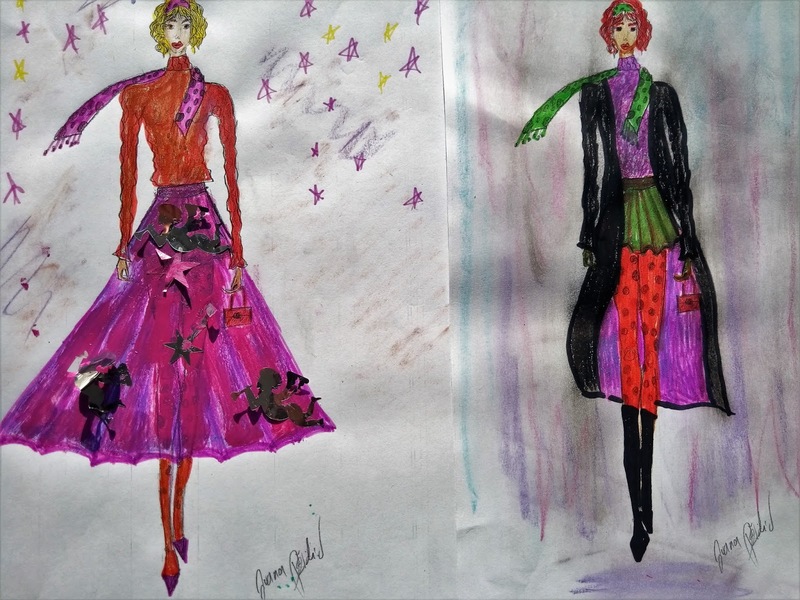 Today I'll show you new art & fashion sketches that I have been working on in recent time. 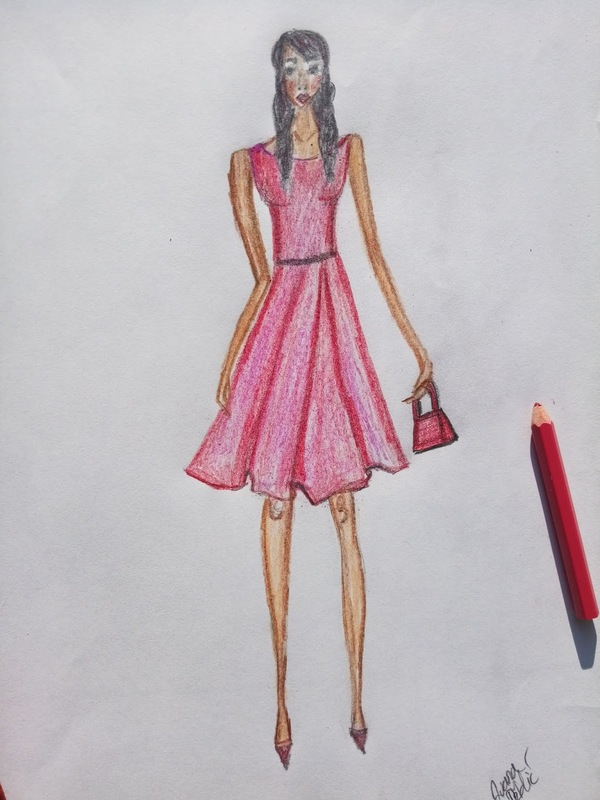 I took a little break from illustrating runaway fashion to focus on my own drawings & creative projects. This turned out to be a fun fashion illustration. I actually sketched a single outfit first, but then I decided to add another one. The final sketch features two girls. I like the friendship vibe that's going on here. 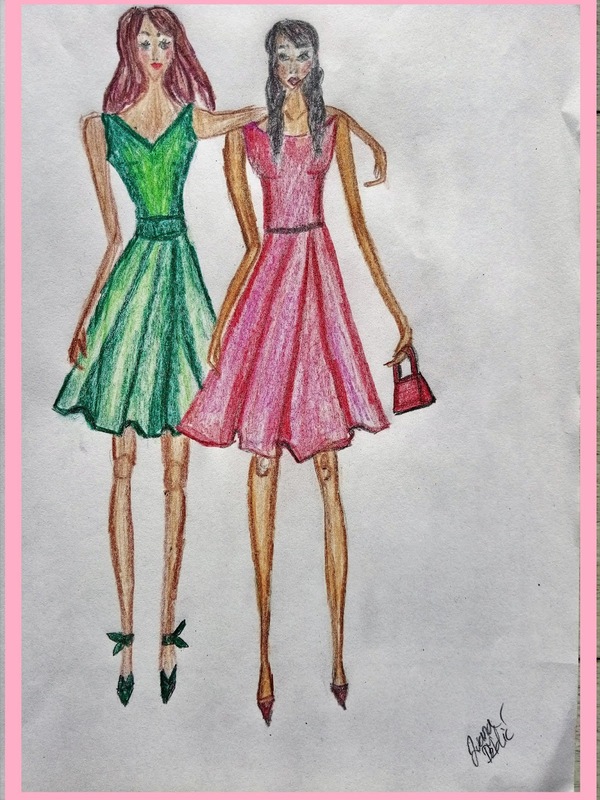 It's a fun twist on a classical fashion illustration. I was inspired by this dress. 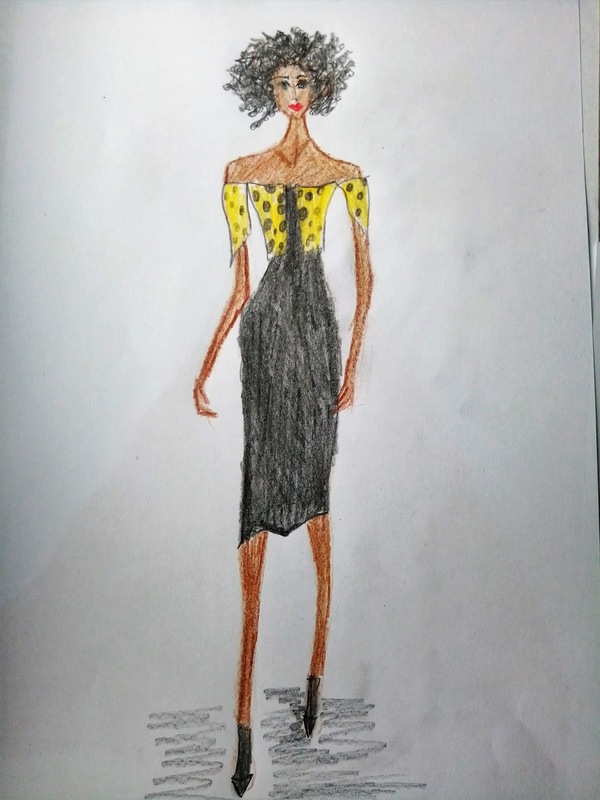 Bellow you can see an illustration of a grey midi dress topped with a yellow detail with polka dots. I'm still not sure whether I mean it as a part of the dress or some kind of cropped jacket or blouse on top. I like to wear cropped items with maxi or midi length. If you don't have anything cropped, you can always tie a shirt or knot a blouse and wear it over your maxi or midi. That's a neat trick that I might use some time this spring. The medium for this illustration is also coloured pencil on paper. 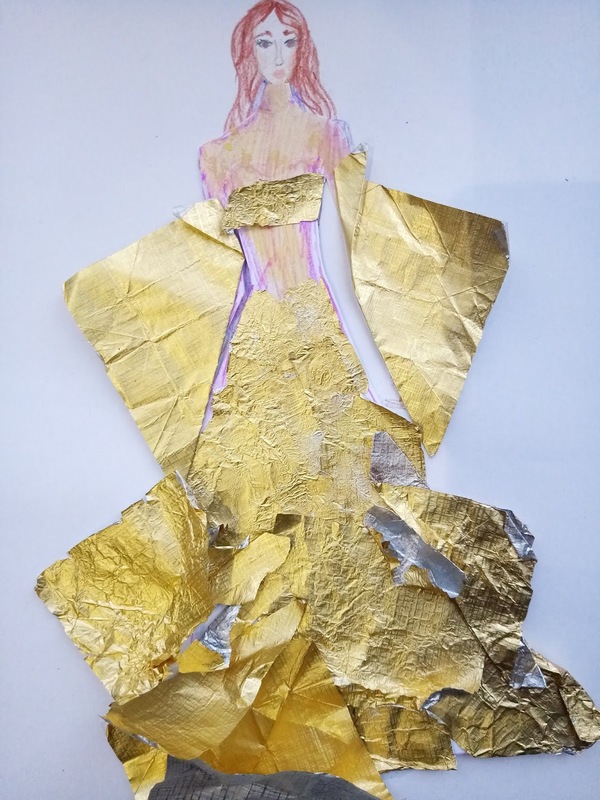 I also decided to play a bit with my fashion illustrations and make some collage art by using my photography as the background for my fashion drawings. 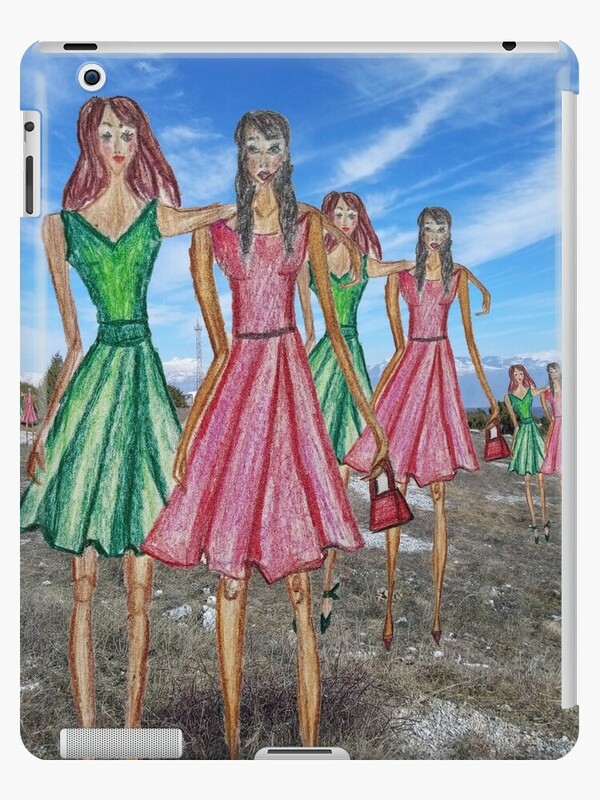 That's always interesting, seeing my fashion illustrations placed in photographs. 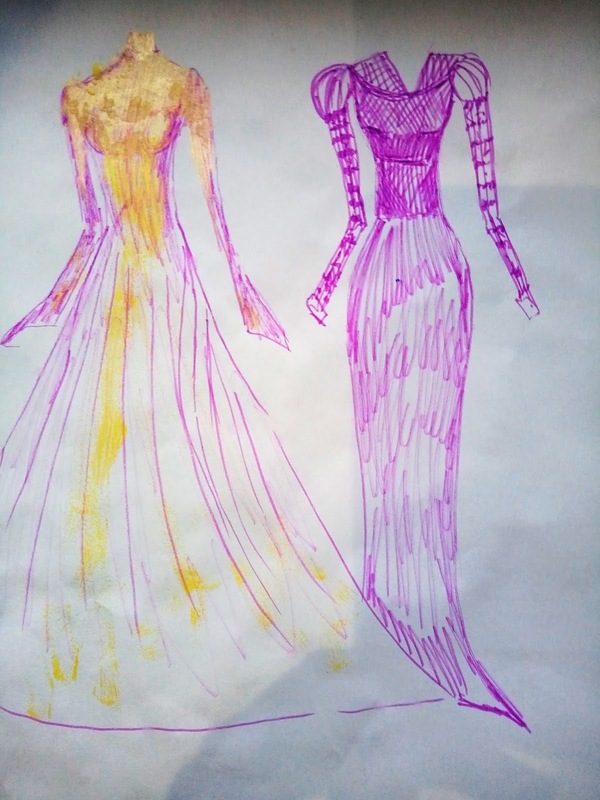 I might also take my fashion illustrations with me sometimes and take photographs of them. That sounds like a neat project too. Let me know what you think about these. I made this friendship illustration available in my redbubble shop. 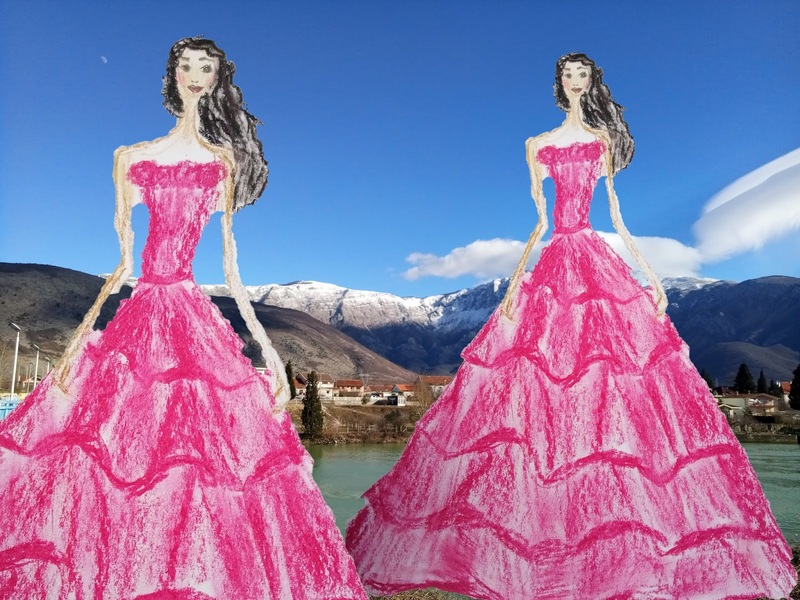 I made two pastel fashion illustrations, both of them depicting pink gowns. I'm getting Valentino vibes from that, so maybe that was my (unconscious) inspiration. 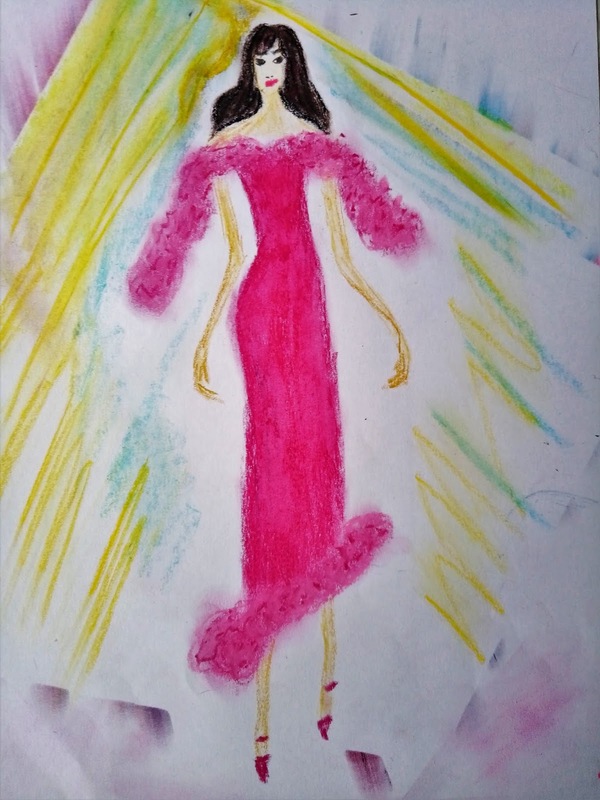 Using oil pastels for fashion illustrations is quite interesting and I'm really glad I decided to give it a try. Well, you know me, I always like to try new things, new art medias and see where it might take me. 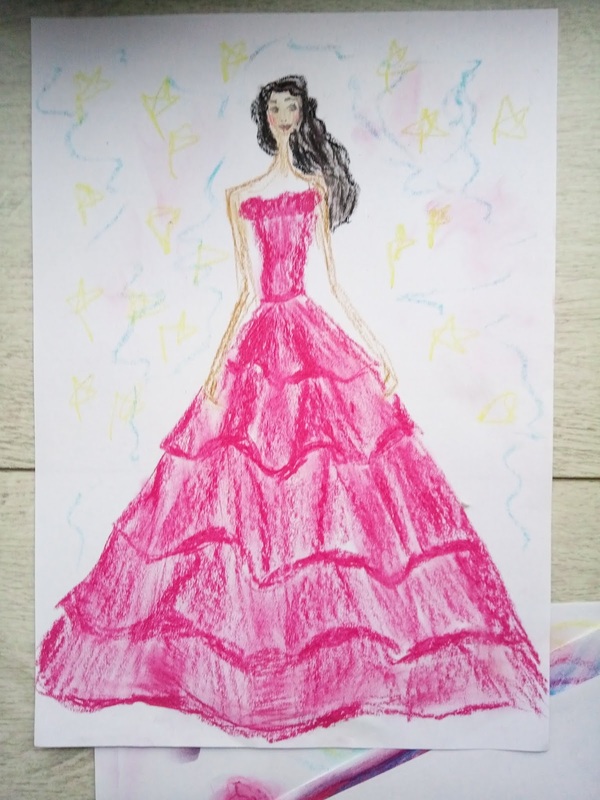 I don't know if you know, but fashion illustration crafts and DIY projects can be a great activity for kids (and people of any age really but I'm mentioning kids especially because they need to work on their hand and eye coordination). If you are an educator, a parent or a big sister/brother/cousin, it's something you can consider. 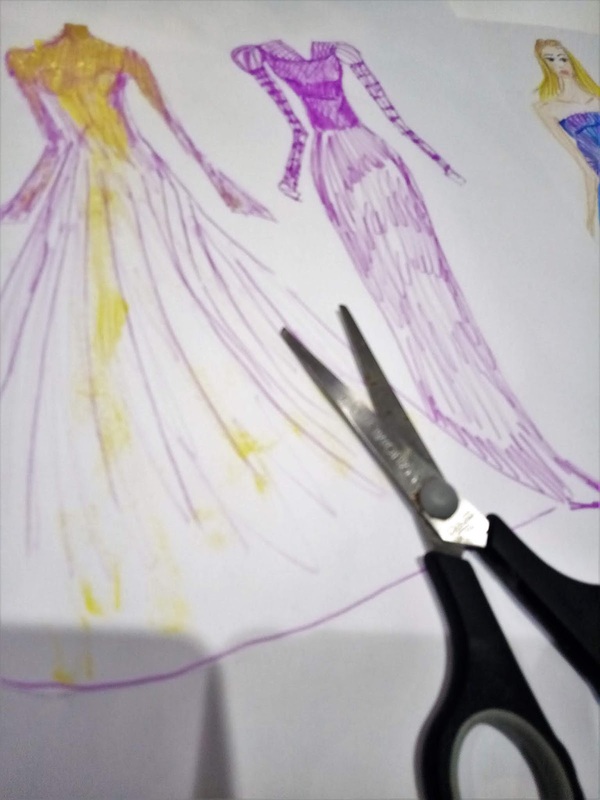 Cutting out paper clothes, positioning them onto paper dolls or just drawing clothes, are all wonderful ways for kids and young ones to develop their hand and eye coordination. 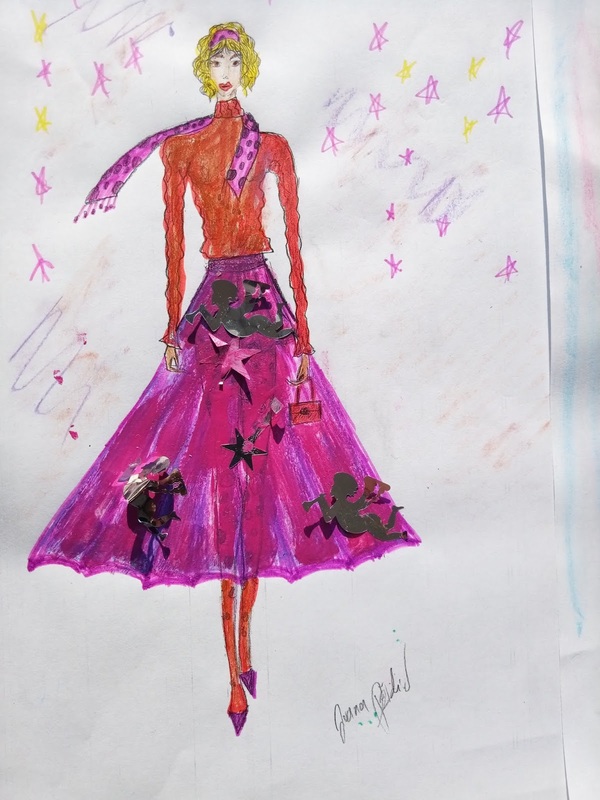 I've used fashion illustrations in workshops and in teaching and let me tell you- kids love them! Bellow you can see some art I made with the help of nail polish. 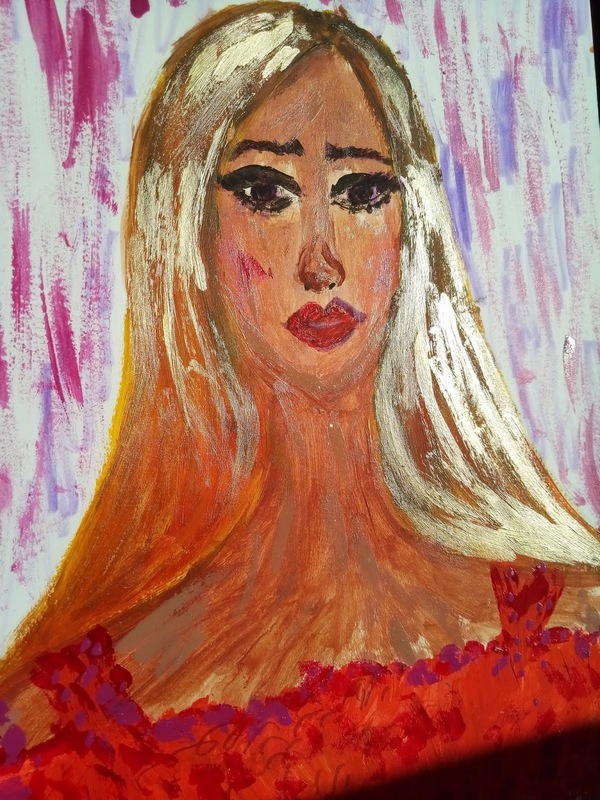 In the first painting, I utilized golden nail polish to make this portrait style painting glow. The effect was quite interesting. I like how this painting shines when light catches the nail polish highlights. When it comes to using nail polish for crafts and painting, I mostly use it to highlight or add accents. I haven't done a full nail polish painting, maybe some day. This is a great way to use old nail polish in an eco friendly way. Creating art with old make up or nail polish is always a good way to make use of it. It is nice when we can have fun and get creative. What is important with these kind of DIY projects involving them is that you air them. Nail polish (as you all know) has an intense fragrance. Bellow you can see a fashion illustration that I repainted with nail polish which also served as a glue of sorts. I applied some left over decoration onto the freshly painted skirt and they got glued to it that way. That's another neat trick you can do. 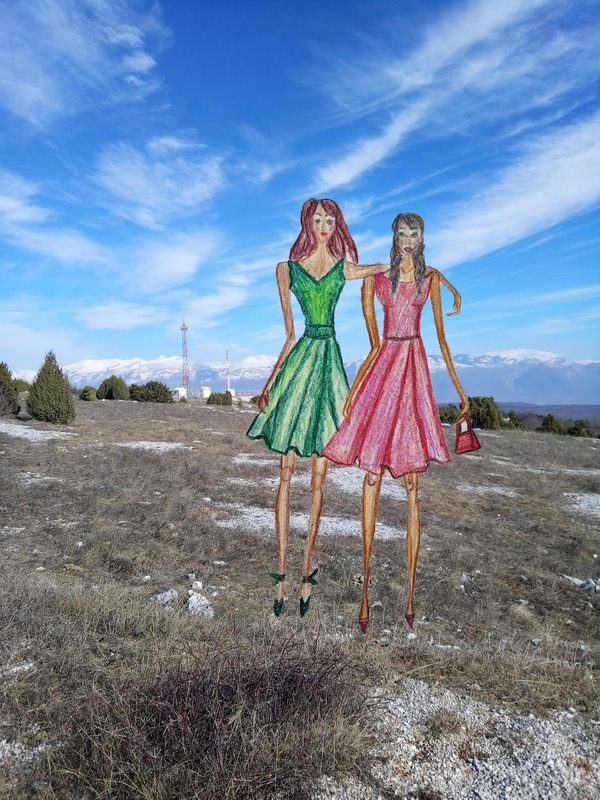 I actually used copies of my previous fashion illustrations here and then I painted over them. That can be another fun activity for you to do. 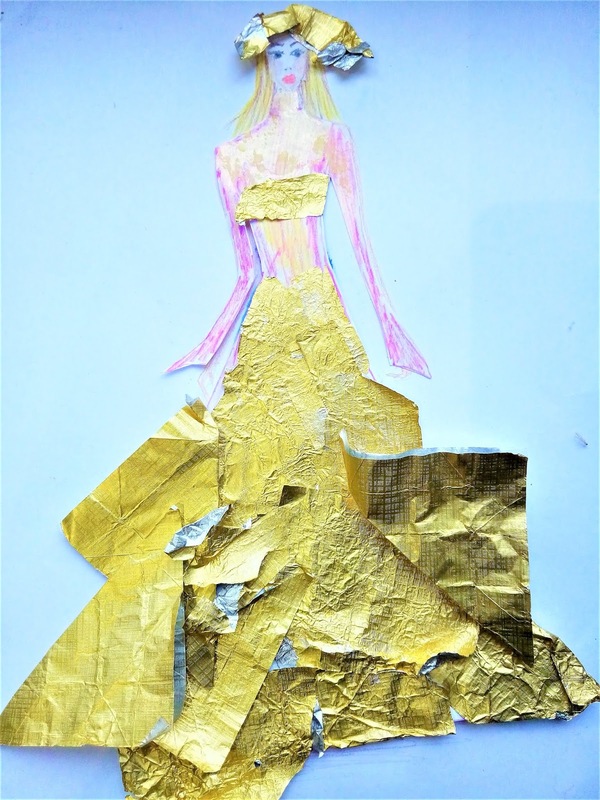 You can copy a fashion illustration and then colour it in different ways and using different media. 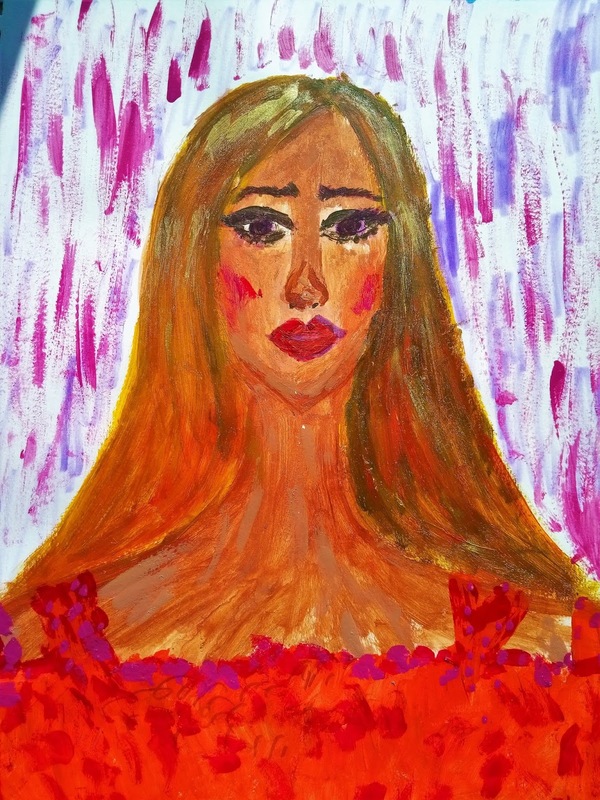 Here you can see me using crayons and nail polish but the possibilities are endless really. Thank you for reading (as always), I hope you'll find something that inspires you here. Finally, I wish all of you ladies a happy International Women's Day! All the best to all of you. It seems like you had a lot of fun with these. I love how you always go beyond the standard pencils and paint and utilize different elements with your art. It shows how the limits of creativity are only what we make it. I definitely feel the spring vibes and can't wait until the real season arrives. Thank you Rowena. I like to experiment with different media. 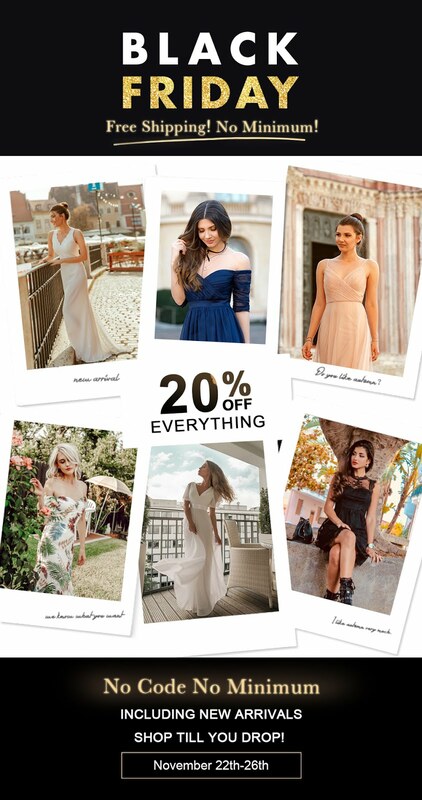 Gorgeous post Ivana! I love the collages of your sketches and photography. The first 2 dress are my favorites. The style would be so versatile for so many occasions. 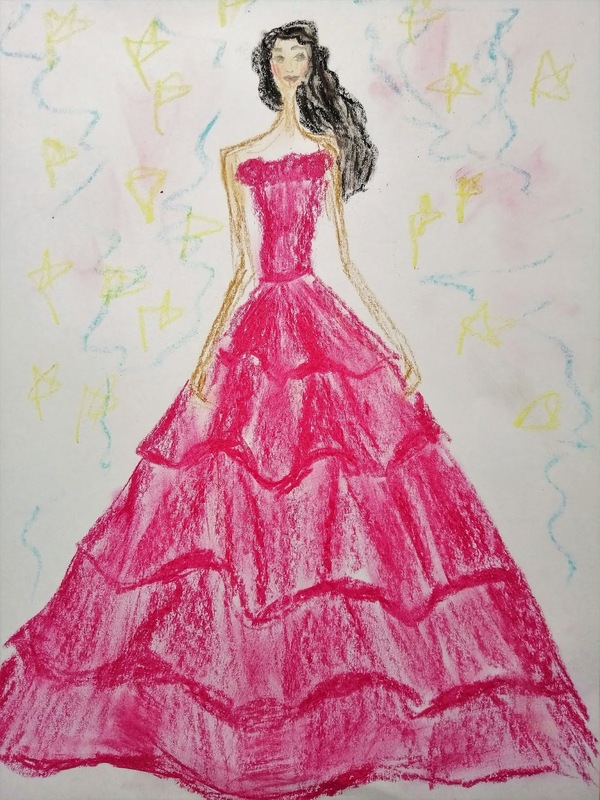 The long flowing pink gown is amazing! thank you so much. 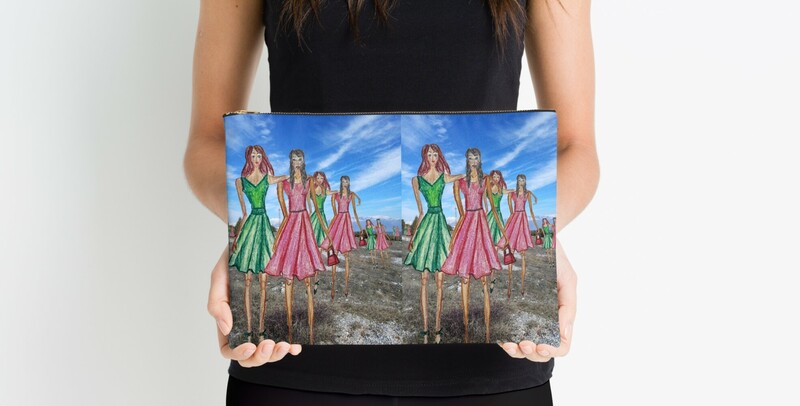 It is fun to make these collages, it feels almost like taking my art for a walk. They look great! Do you want to be friends on bloglovin? It's my link, I follow back. You are a true artist, you use and you experience many techniques. I love the multiplication of paintings in the photos. And the use of nail polish is very creative is a woman in love with the beauty world. Soon Sooo talented. These are beautiful. These are so beautiful and creative. 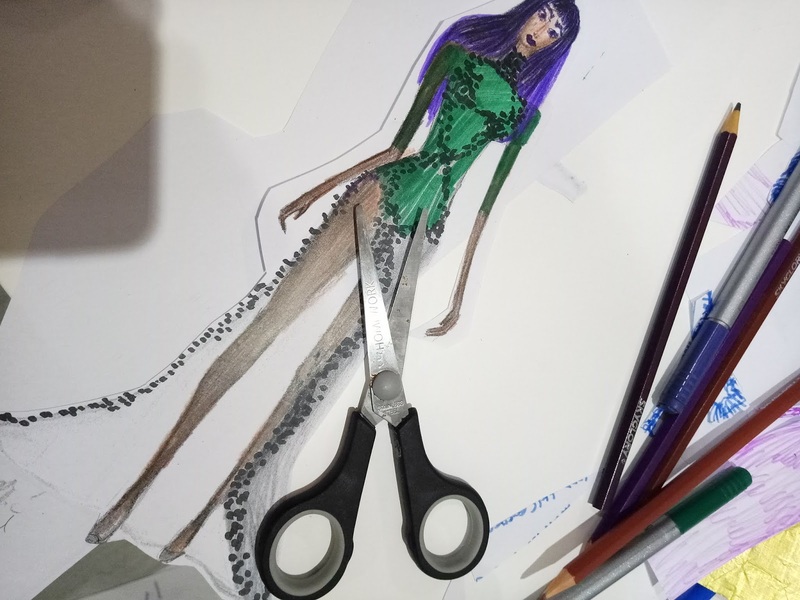 I love to see your fashion illustrations since you always come up with such create ways to execute the concepts. I especially liked how you transformed older illustrations by coloring/painting over copies of them in different ways. Thank you, I also did this kind of activities with my students. You are so talented! These illustrations are beautiful! Love seeing the techniques that you used for each! Your illustrations are amazing Ivana!!! You are so creative and I love to see what you come up with! 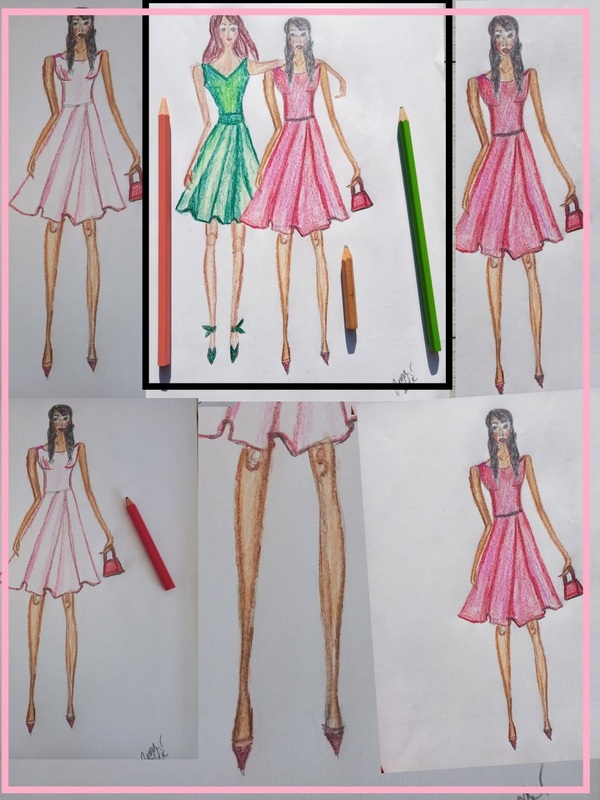 CONFESSION: I had interest in fashion illustrations, and you've been fueling my inspiration! This is another nice collection of illustrations by you here. Well done!